Staging your home for the market can give you a huge edge on the competition. With home sales on the rise, it’s more important than ever to make sure yours stands out. No matter what market you are in or what size home you have, home staging can make a huge difference. It will help you sell your home faster and for more money. In fact, staged homes are reported to sell for 17% MORE than a home that isn’t staged and spend an average of only 11 days or less on the market. It’s no secret – home staging works. So, how can you use it in your home? With over 10 years of experience in home staging, we know the home staging tips that make the most difference. 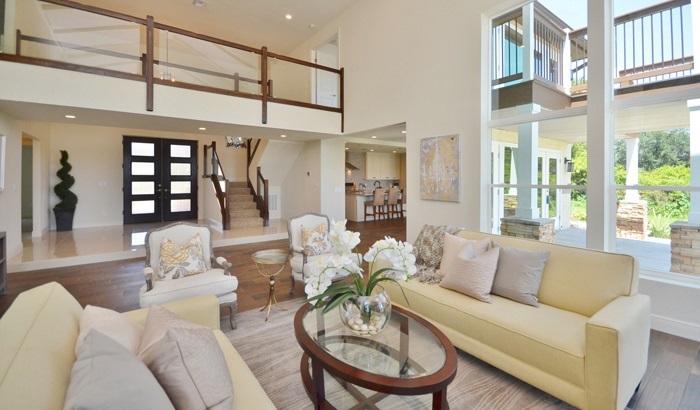 Here are the first five home staging tips in our top ten that everyone should be doing. They are all easy to implement and most require only an investment of time. 1) Clean up your curb appeal. Curb appeal is one of the most crucial elements of your home to get right. After all, if a buyer drives up and isn’t impressed with the exterior, they are likely to pass on even checking out the interior. Take a few minutes to walk down to the curb of your home and look at it from a buyer’s perspective. Is the mailbox looking dingy? Are the house numbers clear? Are there trees covering up the windows? Next, slowly walk up the driveway and to the front door, looking at every detail. Are there cracks in the pavement? Are there weeds sprouting? Do the gutters need to be cleaned? All of these small details can come together to make your home look unappealing to buyers. Take the time to spruce everything up because buyers will definitely take all of it into account. 2) De-clutter every room and closet. De-cluttering is the act of getting rid of any unnecessary items that are on your floors, surfaces, and even your walls. The décor should be minimal when your home is up for sale. There should be very little on your countertops, so hide away appliances such as toasters and blenders. Take down all the magnets and artwork on your refrigerator. Thin out the décor on your shelves. All of these things will help your home feel larger, as items like these can make a home feel more cramped than it actually is. Your closets should also be de-cluttered and organized. Buyers will be peeking inside of them, so if they are filled to the brim with items, they will be put under the impression that the house is lacking in storage space. Consider renting a storage unit or borrowing space in someone’s garage while the home is on the market to thin out what is there. Take down any family photographs and children’s artwork before you start showing your home. While these are beautiful things to have around, they can distract buyers and make some of them feel uncomfortable. You want them to be imagining their new lives in the home, not thinking about how they are walking through a stranger’s house. Also, put away things like toothbrushes and other personal toiletries. 4) Neutralize your home’s color palette. Buyers have a large variety of tastes. While in a perfect world, buyers would only look at the bones of a house and not worry about the cosmetic details, that is simply not true of the real world housing market. Things like bold paint colors, wallpaper, and outdated décor can be major turn-offs to home buyers. More buyers than ever want a “move-in ready” home, so if they walk through your home with a mental list of all the things they need to change before moving in, it’s likely they are going to submit a low offer or pump on the breaks altogether and choose another home that is move-in ready. To make sure your home appeals to the widest range of buyers possible, it’s important to neutralize the color palette. Paint the walls in a neutral beige or gray and cover bold furniture in neutral slipcovers. If you have really colorful carpet, we recommend switching it out, but if it’s not in your budget then you can use some nice, neutral area rugs to offset the color. Then, you can bring back in some color through smaller decorative accents. It’s all about giving buyers the opportunity to imagine their own décor in the home, not yours. 5) Take care of any repairs. As homeowners, it is inevitable that there will be repairs needed in our home at some point. Even the best cared for homes will run into at least some issues in their lifetime. But leaving these issues to the next homeowners can be a major deterrent to potential home buyers. They will be calculating the cost as they tour the home and those calculations will affect the offer they submit – if they decide to submit one at all. A home that is move-in ready is far more appealing to buyers than one that needs a lot of repairs. And, even if the repairs are small, they will have potential buyers wondering what else might be wrong with the home that they can’t see. Patti Pierucci is an accredited home stager and can help you get your home in shape to sell. Call Patti at 434-660-9063 for a free consultation. 6) Do a thorough deep cleaning of your home. Even if you regularly clean your home and keep it well-maintained, every home should go through a special deep cleaning right before it goes on the market. This means scrubbing the windows, steaming the floors, and getting all of those hard-to-reach places that you usually skip. We recommend hiring a professional cleaning crew to come in to use their strong products and skills to make your home shine. Some of the most overlooked spots are the baseboards, air vents, and ceiling fans. You will be amazed by how much of a difference it makes when these areas are dusted and polished. The baseboards especially make a big difference on how clean your home looks and feels. They often get scuffed up, so after cleaning up marks and damages, put a fresh coat of paint over them to make them look new. 7) Get rid of signs of pets and children. Homes where pets and/or children have been living can be a turn-off to some buyers who think these homes have been less cared for than ones without them. In order to appeal to the highest number of buyers, you’ll want to limit the signs of pets and kids. 8) Make the bed every day. This is a very simple step, but it can make a big difference! Make sure all the beds in the house are made every day before showings. A messy bed can make a room look cluttered and unappealing. You can even add some extra pillows, a throw and maybe even a tray with a couple of wine glasses on it to really set the stage and help buyers imagine it as their own personal retreat. Another easy staging tip is to set the dining room table, breakfast table, and kitchen island (if it has bar stools) with plates, placemats, and stemware, and include a simple centerpiece on the first two. This small touch will ignite a buyer’s imagination. It makes the home feel warmer and more inviting, which will appeal to a home buyer’s emotions and help nudge them toward making a handsome offer. 10) Let the light in. Good lighting is crucial to making a home look and feel great to buyers. If there are any trees blocking light from the windows, trim them back to allow the light in. Some homes lack good natural light, so in those cases, introduce some nice artificial lighting to the spaces that need it. You can also paint the walls in a lighter color and use light fabrics on the window treatments. Light helps a space feel much larger and more open, two big selling features to all home buyers.